Synopsis: An eccentric single father (Jeff Daniels) helps his 14-year-old daughter Amy (Anna Paquin) lead a flock of orphaned geese home. 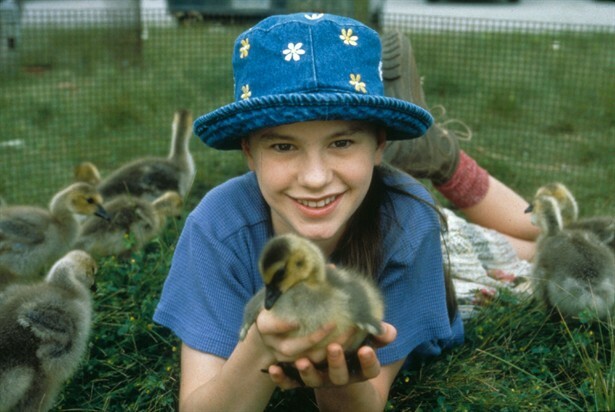 Anna Paquin (just a few years after her Oscar win for “The Piano”) is adorable as the teenager who finds a purpose after her mother’s death by saving a nest of orphaned geese. A very shaggy Jeff Daniels is also wonderful as her artistic but often clueless father, who never counted on raising her on his own. When he realizes how much the birds mean to her, he refuses to let the local game warden clip their wings. He figures out a way to help the birds migrate south: He’ll fly a glider with the loyal geese following behind. Of course, they’ll only follow her, so he’s got to let his little girl try out her own wings as well. Animal Deaths: Just the mother goose in the beginning. A scene where a game warden tries to clip one of the bird’s wings to prevent it from flying might also upset children.